Built as a winter and summer escape for a couple or small family, this beautiful four season log cottage is one of a kind. The site is extremely private in a very wild and scenic setting on the famous Chippewa Flowage...only 17 miles from Hayward. The 'Flowage is a 17,000 acre lake with hundreds of islands and 200 miles of 95% undeveloped lakeshore. It is one of the more famous wilderness lakes in Northern Wisconsin and the Hayward Lakes Region. The home makes a wonderful four season retreat...very private...with spectacular and private water views!! 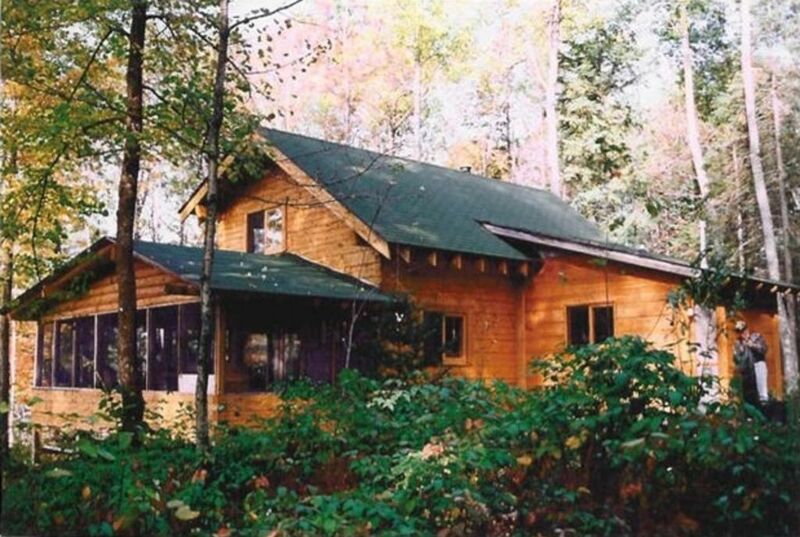 The Adirondack style log cottage sits on a large 60 acre parcel with an abundance of lake frontage in a very private wooded setting. The views from the home are 100% natural...nothing but trees and undeveloped shoreline!!! The large screen porch has great views to the lake making evening dinners seem in the outdoors... the lake side fire pit and chairs create a great place for reflection or marsh mallow roasts...the 3/4 mile private wooded trail is lined with huge pines and is perfect for quiet walks... the kitchen-great room is decorated in a classic northwoods decor with many handmade rustic furniture pieces. (The cabin and much of the rustic furniture was built by the owner.) The second floor loft-bedroom has three beds...two doubles and a single...is very spacious and is lined with windows creating beautiful views to the lake. Wood floors, rustic furniture and an abundance of windows add to the Northwoods feel of this unique property. The home is located on the North East corner of the very famous and wild Chippewa Flowage. Paddling or boating adventures up the river are close and easy and a paddle boat ride around the bay is even easier. This section of the lake is truely a wilderness area...make a left off the dock and it is miles to the next home. All 17,000 acres of the Chippewa Flowage can be your boating playground!! With the famous resort town of Hayward just 17 miles away you can choose from a variety of world class attractions, restaurants and shops. If you are looking to relax in private with your loved ones this is a place that exudes family time. Whether it is canoeing up the nearby river, boating out the lake to the ice cream shop, a boat ride to one of 10 lake resorts for a cheese burger, catching some fresh fish for dinner, walking on the private woods trail, biking on the forest roads or reading on the screen porch, you will be able to relax undisturbed in this unique northwoods retreat. Winter is a very special time here...a true winter wonderland. The snow is a pristine white...the solitude at a level that forces you to unwind. Whether it is a snow shoe down the shore of the lake to the river...a slow cross country tour down the private woods trail or a candle lit dinner in front of the fire...winter is a great get away time. Try the winter...you will be glad you did!!! We built this cabin as a family retreat in 1990. Privacy was our number one priority...we wanted a place to go and relax...a place for high quality family time. We live in Hayward and this cabin continues to be one of our favorite places to get away to! We live in Hayward and wanted a very private location on the Chippewa Flowage. Privacy, Quiet, Beautiful natural views and Abundant Wildlife. Very large lake parcel with superb privacy and views! The winter-to-spring transition was happening. Exceptional sunlight across river ice and that bracing smell of melting snow. River otters were playing. And eagles were prospecting nest sites. Didn't see another person while we were there. I always appreciate Guests who enjoy the special quiet-nature-solitude that our cabin get away offers. Smelling spring arrive is something only a lover of the outdoors would comment on....but yet it evokes a strong image for those of us anticipating the arrival of spring. Glad you enjoyed your visit! Just what I needed. Peaceful, tranquil; a place for thinking, reading and walking through the woods. This cabin is rustic but kept very neat and clean. Back again and loved it! I loved this cabin in Oct 2017 so decided to go back to enjoy the winter beauty near Hayward. The privacy, the quiet, the beautiful view of the snow covered lake, the deer that visited the property, and the great places to snowshoe and ski nearby made the trip fantastic! We were a little worried about whether the cabin heat would be adequate in low temps but we were toasty... even without building a fire (which is a great option to make the cabin even more cozy!). Fred has always been very friendly and helpful when I’ve emailed or called him. I will be back to experience the warmer weather next time! What a lovely real log cabin in the woods. Private, clean and clearly loved. We had a great time and will be making plans for next winter very soon. The property had everything we needed for the four nights we were there and Fred (the owner) stayed in touch in case there was something lacking. Our favorite thing was the wood stove as it was -28 F one morning. Thanks for sharing the place Fred. This is a beautiful place! You can see all the love that was put in the log cabin. Very private and peaceful! The view is Amazing! We seen several Bald Eagles, and you can gaze at the stars from the bedroom! We went in January for an early Birthday get away - The weather was perfect! Went for long walks and enjoyed the cozy fire in the fireplace and down by the lake. We plan on going back soon!